Kimi Raikkonen believes that incidents at the start of grands prix are inevitable, even if the FIA clamps down on poor driving in Formula 1. The 2007 world champion’s team-mate Romain Grosjean was banned for this weekend’s Italian Grand Prix after he triggered a huge first corner pile-up at Spa last weekend. Grosjean is the first driver to receive a ban since Jacques Villeneuve at the 1997 Japanese Grand Prix (although the Canadian raced under appeal), and the first to serve a ban for causing an accident since Mika Hakkinen in 1994. But Raikkonen believes that even if the authorities start using harsher penalties to get drivers to calm down, there will still be accidents at the start of races. 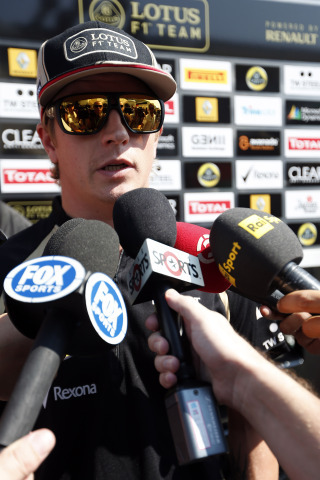 “Accidents happen, that is part of the sport,” Raikkonen told reporters at Monza ahead of the Italian Grand Prix. Raikkonen added that the difficulty of overtaking in Formula 1 means that drivers will always try to make up as many places as possible at the start. “People try to improve their position at the start because it is the easiest place to overtake people,” he said. The Finn has a new team-mate in Jerome d’Ambrosio for this weekend, and he is confident that the changes on the other side of the Lotus garage will not have an adverse affect on the team.